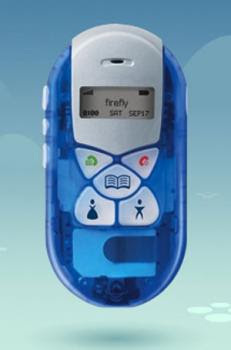 The new Firefly wireless phone is designed for kids. It is easy to use. Just press a couple of buttons to place a call. There is no need to remember numbers or dial. The special phone book makes this possible. It can hold up to 22 pre-programmed numbers. Use parental control options to limit incoming and outgoing call to the numbers in the phone book. With just 5 (front) keys, it brings mobiles back to what they were originally designed to do - keep you connected. Firefly phones also keep it fun with lights, sounds, colours and animations. Most importantly, it has PIN-protected features so you can control who the user receives calls from and, who they speak to. Firefly Fireworks™ display flashes when making and receiving calls, during standby, and when charging. A huge range of accessories to choose from. visit www.mrmubi.com for latest news.